Fourth Day of Christmas – Crewel Embroidery! Welcome to the Fourth Day of Christmas Give-away! All you crewel embroidery enthusiasts out there will love this one – it is a combination give-away, from Wooly Thread and from Talliaferro Designs. It’s for the whimsical embroiderer and for the serious embroiderer, all rolled into one. Today’s give-away is one gift, in two parts: a Wool & Hoop crewel kit from Wooly Thread and the latest (and not yet out) Talliaferro Design kit, Paradiso I. 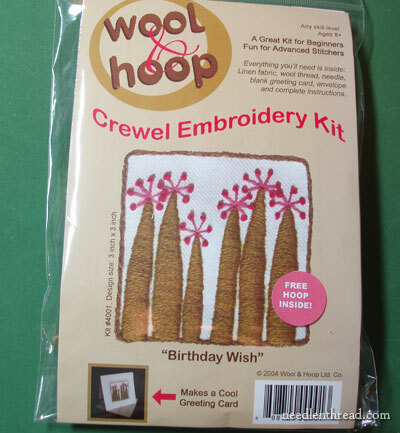 This Birthday Wish Wool & Hoop kit from Wooly Thread is a complete kit, from fabric, to hoop, to wool, to needles – and instructions – for a 3″ x 3″ fun pattern of funky birthday candles. The finished product is modeled as a birthday card. It’s a fun and quick little project! You can find all the Wool & Hoop kits available at Wooly Thread – they’re fun, a bit funky, and quick to work up! They make cute little accents, or they can be used in other applications (like card-making). Then, when you’re in the mood for something more challenging and elegant, you can move on to Paradiso I, the newest Talliaferro Design which will be released after the first of the new year some time. Like the Royal Persian Blossom design released earlier in 2011, this is a design & instruction kit. That is, it contains the design and step-by-step instructions for the completion of the design. It doesn’t include fabric or thread. The thread used in Talliaferro Designs is Appleton wool, available through Wooly Thread. Paradiso I is quite a bit smaller than the Royal Persian Blossom design, at 8.25″ x 9.5″, and the stitches are not as complex, but the results are exquisite. The taupes and the blues work beautifully together! Some of the stitches involved: Chain stitch, French knots, buttonhole, long and short stitch, satin stitch – so plenty of variety, but nothing too daunting! 1. Leave a comment at the end of today’s article. If you click on that link, it will take you directly to the comment area, so that there are no mishaps! Comments delivered via e-mail or on other articles will not be included in the give-away. Some self-analysis: are you a Wool & Hoop kind of stitcher, or a Talliaferro Designs kind of stitcher? Or a combination of both? Both crewel design companies have a completely different look and feel – which one characterizes you the most, or do you identify with both? 3. Make sure you leave a recognizable name either in the body of your comment, or on the “name” line above the comment box. For example, if your name happens to be Holly, you might include a last initial or a location to differentiate yourself from any other Holly that might join in. 4. Leave your comment before January 9th, 2012, at 5:00 am Central Standard Time (Kansas, USA!). All winners for this series will be selected on January 9th, and announced that day here on Needle ‘n Thread. You’ll have to check back on January 9th to see if you’ve won, because the winners will need to contact me within 3 days to claim their prizes. The Give-Away is Now Closed. Thanks for your interest! Please do not panic if your comment does not show up immediately. All comments are moderated in the order in which they come in, and they will eventually be posted. If you are looking for your comment, please use the “older comments” and “newer comments” links at the top of the comments section. These will take you through all the comments pages, from newest to oldest. I am most definitely a Talliaferro kind of stitcher: I like a challenge, something which requires a lot of work, which gives me a real sense of acheivement. I am a Talliaferro Designs kind of stitcher. I can really ohh and ahh over beautiful designs and they make me want to make them and experiment with them. I have had this since I was a little child, I was mesmerized when I first saw the beautiful and colorful dresses of the women in india and when I saw the movie of Sissi I wanted to live in that era and wear those dresses! In my opinion the world can never have enough beauty full things in it. Beautiful flowers, beautiful landscapes and beautiful designs they are all eye candy! I did experiment this year with a color block type of crewel embroidery–it fit the subject and was fun to do; quite liberating as a matter of fact. For the most part I prefer traditional crewel designs and look. But, who knows what will be in 2012–that’s what stash is for, yes? Wow, hard question but amazing prize! I’m currently working on a crewel embroidery and loving ever single stitch – it’s more in keeping with the Talliaferro style, but that’s not to say I don’t love the wool and hoop too! I am currently renovating my 1884 Victorian house, using a mixture of original features and modern design so either of these would fit in well in my house. the talliaferro designs are wonderful . I am of course a wool and hoop kind of a stitcher .thanks for this awesome giveaway .Hope I win this. i’m neither one entirely but a little bit of both — i like the playfulness of the wool & hoop design (and would probably send it as a card) but the calm, classic effect of the talliaferro design has a very powerful attraction, and its more intricate design looks like it would be fun to stitch. thanks for these lovely giveaways, mary, and happy new year to you. Happy Fourth Day! Crewel work is my “go-to” process. I enjoy working with wools and am always very comfortable when I’m in my crewel world and am most definitely a Talliaferro Designs kind of stitcher. I would love to win this one! Thanks for sharing all the wonderful gifts with us. I hope you have a great day, Mary. Stay warm!! Although I love the energy of Wool and Hoop, I am definitely a Talliaferro stitcher. I am obsessed with the Jacobean period. What a treat to see all these lovely give aways-they are all making the creative juices flow. The candles design has been appealing to me for quite some time. I think it may be on a book cover?? Only, I didn’t realise they were candles. Thought they were some funky sort of trees, like our bottle trees here in Oz. So can see myself adding a branch or 2 and the odd extra ‘flower’. Umm, we do have flame trees here in Oz too so…there we go! I absolutely love that crewel design and colouring. Both the designs/kits make my skin prickle, so guess I’m definitely combo identified. I reckon a special good luck to myself for this one wouldn’t go astray! A wonderful thank you to our suppliers for this beaut giveaway. And you Mary, for joyously offering it to us. I am eger to learn both techniques. Happy new Year 2012, health, love and prosperity. I’m a “combination of both” kind of stitcher. I don’t like to limit myself. I enjoy making things and usually end up giving them away. In that way I get two enjoyments – the first in making the item, the second in seeing someone else’s joy in receiving it. I can identify with both! I definately am drawn to the wool and hoop designs because primitive type stuff has always spoken to me. A simpler time and place(not really but in my mind). But, I am also drawn to the beauty of the Talliaferro Designs. Mary, its been quite a few years since I’ve stitched any crewel work. I’ve not stitched kits from either of these companies, but am always open to new stitching opportunities, especially when I can choose my fabric and thread colors. Loving these give away opportunities. I think I am a bit of both but lean more towards the Talliaferro Designs. I love the new one. Oh, I love that book The New Crewel! I bought it a few months ago but never had the chance to start any of the included projects as it seems to be quite impossible to buy the specific wool in Germany. So I’m definitely the Wool & Hoop kind of stitcher. I clearly identify myself with the look and feel of this kind of stitching. I hadn’t realized until giving thought to your question, but I am a combination of both a Wooland Hoop and a Talliferro kind of stitcher. There are times when whimsical, fun and fast is perfect and other times when I want to stitch a more intricate design. Hi,as i am not familiar with crewel embroidery,though very much fascinated by the Royal Persian Bloom Design, this kit might help me do one. As I have just finished one project and just started another, I have “way” little to do. Both of these projects look like fun. I would love to work them both. Actually, I’m neither–but if I had to choose, I’d go with the Taliaferro, and pick a LOT brighter and more realistic colors for it. I’m more fauna-and-flora oriented, really…the modernistic stuff like the woolythread designs just look…unappealing to me. Talliaferro Designs stitcher definitely! It is just a matter of what I see that interests my tastes at the time! Definitely a Talliaferro Designs stitcher. I’ve been doing crewel embroidery since I was a child. I love the elegant designs and the variety of stitches. I would love to say I would really love to win this but I don’t know whats ahead!! I would say I am both kinds of embroiderer…the wool & hoop kind for my 15 min blocks & the Talliaferro is the kind I would enjoy completing…it would satisfy my sense of accomplishment. I’m beginning to enjoy this! Makes me feel special, even I I don’t win anything, just that its on offer. I feel more like a Wool and Hoop stitcher, but I am actually a combination of both. I think your website is fantastic–it is a daily part of my life. You give so much to all of us. Thank you. I am definately a Talliaferro Designs kind of stitcher, while I have done funky designs for my grandchildren, I can’t resist the Talliaferro type of designs, this one is so beautiful, thanks for the opportunity of maybe stitching this one. What a fantastic duo for crewel lovers! I am in both camps, the modern and the more classic. I thoroughly enjoy embroidering the traditional motifs because of their use of a wide variety of stitches and patterns, and the modern because they are simpler and more fun – a welcome break. I have not yet tried any of the Wool & Hoop designs, and I am (ahem) currently working on an RPB design, so can appreciate the subtlety of Anna’s designs. I would say, though, that I am probably more traditional than modern in the designs I work. Thanks for this great chance, Mary. As I am pondering if I prefer to work with wool or thread , I am recalling past projects and the fun I had working with both . Lots of good memories and room for more with either one of these projects. I am definitely a Tallifaro type. that design is so pretty! I am a Talliaferro Designs kind of stitcher. Not as primitive as the Wool & Hoop. I am a Talliaferro Designs kind of stitcher. Very detail oriented. I’m definitely a Talliaferro Designs kind of stitcher. I like the formal looking, fancy designs. Recently I found a Wooly Thread kit at a thrift store for a dollar. I own the book New Crewel by the creator of the design. I have to say that I have been disappointed. I have not yet put my needle and thread to something as fine and complicated as a Talliaferro design, but I hope to do so soon. I think that is much more to my style. However, my 2 year-old and 4 year-old loved helping me stitch the projects in the Wooly Thread kit. I am very much more the Tallifero type. I find the Wool & Hoop designs cartoonish and just plain not. my. style. I can theoretically see their appeal to the beginner in crewel, but I wonder if they should shift their focus to somewhere more between what they have now and what Tallifero does. Not so detailed or traditional designs as Tallifero, but not so Sponge Bob as what they have now. I could definitely see interest in steampunk-type crewel designs and ones that fit in with contemporary decor without being so… well, so basic. I’m afraid Wool & Hoop, in its design process, is talking down to beginners with its designs. WOW! This just gets better and better. I confess, I am a wool and hoop stitcher, but then, I didn’t know there was another way. I would be anxious to learn anything new. Honest answer is Neither – I haven't used any of these kits before. Judging the kits from their covers, I think I love the elegance of Talliaferro Design than the bolder Wool & Hoop design. I guess that means right at this minute I’m a bit of both and game to try either kit….but ask me again in an hour and you may get a totally different answer so if I won both it would be the perfect solution to a split stitching personality ! I love Jacobean crewel. I have a piece that I did over 35 years ago proudly hanging on my wall. I’ve enjoyed the resurgence of crewel in the past few years and would love to add these to my repertoire! I am definitely a Talliaferro Designs stitcher. Beautifully traditional designs and the colours are subtle and well matched. I have bought the first design already. Once more wonderful news. At the moment I only start learning crewel embroidery and stitching Tanja Berlin kit. “Paradiso” maybe is something too difficult for me at the moment but I’d like to stitch it one day. I could easily identify myself with Talliaferro Designs (only need to deepen my skills of stitching). The colors of both designs match the new furntiure in our family room. Although my style is to present my crafts as gifts most of the time, I think I will keep both of these completed projects to decorate the family room with. The Wool and Hoop and Hoop may be up the longest because the colors will be beautiful in the room. My very first favorite color is blue and the family room has beautiful gold and taupe accents. So it will look awesome in there. I am definitely a Talliaferro Designs kind of stitcher. I love the crewel shapes. I actually identify with both. and I have done designs from both companies.. I think I’m a combination. I love the blues and taupes of the Talliaferro design because it is so elegant but the birthday candles make me smile. I love them both! I actually have the book with the birthday wish pattern in it. I love to make little things with it. but sometimes little is just so little, and I need a BIG project. I’m still saving to buy a Talliaferro design, but maybe I’ll win one, haha! Gwen Kok, Dordrecht, the Netherlands. What a wonderful design is Paradiso I. This is my kind of design and stitching. The Wool and Hoop design is a fun design and looks so easy and fun to stitch. Something quick to do between more difficult projects. I love the colours, too, of Paradiso and they do sit well together. I would say I am more a Talliaferro Designs kind of girl – perhaps a bit too structured but being a Libran I am a bit more precise I think and like the order of that design just as I loved the persian blossom one that you showed us previously. However anything stitching floats my boat. Thanks to you and all the generosity of the companies participating in this wonderful give-away. I love the Talliaferro designs. I consider myself an old-school stitcher. I started in my early teens and was greatly inspired by Erica Wilson. I’m also very involved in a medieval history group and my focus is on needlearts from that period. Crewel work is so tactile and rewarding. The blues and taupes make my heart sing. Talliaferro would be my choice, but oh it is so difficult to choose, once again thank you so much for the opportunity to win something this beautiful. What a great idea for a give away!! I enjoy reading your blog and get lots of ideas 🙂 thanks. I am a “wool & hoop” type. Thanks and Happy New Year!! Good morning Mary, OK, will admit to being a free form wool stitcher. Sometimes turn to kits to learn new techniques, to see how someone else approaches wool work or to test for a class project. The small Wool kit looks to be a fun one and perhaps very reasonable to use for a class project. I’m a Wool & Hoop style of stitcher, with Talliaferro aspirations. Maybe a kit would help me get there…. I’d like to think of myself as young at heart and reaching for the Wool & Hoop design, but the truth is I’d be reaching for the Talliaferro. Mary, I like both styles! Good Morning, Mary – – Must admit today’s giveaway appeals on several levels. Love the whimsical birthday candles, and as it happens, my birthday is about 6 weeks away. But I must admit the Talliaferro Paradisio I caught my special attention as there is something in the design which calls to mind a rooster design of yours I am going to be making this year. I also hope to do the Royal Persian designs I linked to and as your description says that Paradisio I is smaller and not quite as complex, it seems it would be a perfect trainer to prepare me for the other. So I know what my “Birthday Wish” will be, but I can’t tell or it might not come true. I am a combination of both and would love to stitch them both. The birthday wish kit looks like fun, while the Paradiso I kit is more elegant and would be a challenge to embroider. Thank you for challenging us each day. If I have to choose, I would say a talliferro kind. Lots of different stitches, something to learn from. And I like that kit the most. Hello Mary: Just to say, I love your site. I have always been a fan of crewel embroidery. I have a few books sitting, just waiting for the right thread for crewel projects. Please make my books happy as they are lonely just sitting there waiting, waiting, waiting for their day. Thanks, Paula Magnani-Smith on the east coast. Funky and traditional, what a great give-away idea! I’m a Talliaferro Designs kind of stitcher. I am definitely a Talliaferro designs kinda girl! I love the classic look! But I do appreciate the more whimsical, it’s just not my style. Thanks for offing such a wonderful prize to win! I an having fun checking my email everyday seeing what surprises you have in store! I can be either funky or more serious…depending on my mood for the day or project. These look like fun kits from Wooly and Talliaferro…have not played with either but would like the opportunity! I am basically a hoop embroiderer with very little experience with wool. I would love to learn more with these beautiful kits.Thank you for your teaching and caring learning experience from afar. I am a crewel lover-but have never learned how to actually do this style of embroidery. It certainly can be so diverse. I like small projects to learn on and then I would feel comfortable moving into larger designs. These offerings are really wonderful. I have not tried crewel work in many, many years, and never with wool. I would love to try this too! Thank you for a chance to win!! I am more of a Talliaferro type of stitcher but willing to try the more funky style in the Wool and Hoop pattern! Thanks for the fun contest. I am more a Talliaferro Designs type stitcher but would love to try both types. Hope I win. The complexity and elegance of the Taliaferro designs appeal to me. What a good question 🙂 . I would have to say that I identify with both styles… Wooly.. appeals to my whimsical side and appreciation for simplicity. Talliaferro appeals to my sense of design and appreciation of the more complex designs. Both are just wonderful exercises in creativity and needlework. Can’t go wrong with either… decisions, decisions… if I had to choose one… I would buy both :). You would have to ask THAT question wouldn’t you? I identify with both designs. I love the fun and funkiness of the Wool and Hoop design and the elegance of the Talliaferro design. I am a big Wool and Hoop fan and I’m looking forward to her new book coming out. As far as stitching is concerned I’m definitely a beginner at crewel so I’d be inclined to work on the “easy” one first and work my way up to the harder design. a bit more elegant like Talliaferro! I am definately more of a Talliaferro kind of stitcher! However I can also see myself stitching the Wool & Hoop project for my grandchildren. I started my stitching adventures 48 years ago with Crewel and it still has my heartstrings! How fun to have so utterly different looks in one give away. I think I’m somewhere in between. I like them both the candles are whimsical but I’ve not done a modern looking whimsical. Yet I’ve never done anything quite so elegant as Paradiso 1 either, although I think that suits me better as far as my tastes go. So I think if I did these kits I’d make the candles as a gift and work Paradiso 1 for my wall! The candle card would be a fun project to do and to send someone. Very cute. Katherine Shaughnessy’s book “The New Crewel” is a fun exciting trip into a whole new world of crewel work. It ain’t your momma’s crewel work. I checked the book out from my public library, it was so fun I bought myself a copy. I love the freedom of the designs, they have a folk-art feel to them. I clicked on the link to Talliaferro and was lost in a world of stunning crewel work. I visted every page (with my mouth hanging open)those designs are beautiful. The color combinations and stitches, made me want to order all of them. This is your momma’s crewel work and her momma’s and her momma’s! The designs are timeless. The Process 2 page shows the basic stitches, enforcing the fact that anyone can do this. They also point out how crewel embroidery requires very little equipment and is totally portable. I have never stitched a crewel design, so Wool & Hoop and Talliaferro Designs would be great beginner projects. My friend has an alpaca ranch so she would get a kick out of the Birthday card. I love crewel! I’m definitely the Talliaferro type of crewel stitcher. I’ve done a little of the traditional type of crewel, but nothing of a more contemporary nature. This would be the chance, wouldn’t it? I’m somewhere in the middle. I love the whimsical candles and also the elegance of the Paradiso 1. Thank you for such a wonderful variety. Here is my chance to learn something new. Have a very good Fourth Day of Christmas ! Talliaferro for sure – at least I am if we refer to the two designs just shown. I like whimsy but it has to be colourful. I think overall I’m a traditionalist but whimsy’s there too. LOL! I’m a Talliaferro Designs kind of stitcher wannabee! The Paradiso I will be gorgeous I’m sure. I love the jacobean style – so classy. Your talent for choosing these lovelies is surpassed only by your talent to teach, motivate, inspire, and create. I so enjoy seeing what you’re up to every day. My style is a combination of both. I love the Talliaferro design…..with more of a folk art expression. Checked out both websites. Talliaferro Designs caught my attention. Would be perfect for a pair of chairs I have been procrastinating about redoing for quite some time. Ahh…crewel! To answer the question, I guess I fall somewhere in the middle so far as the past since I’ve long worked at restoring old crewel work, which requires skills from both ‘disciplines’. But my bent since I’ve retired and been able to make the choice, is in the Talliaferro direction; I love what they are doing. This is great fun, if only for the dreaming! I am definately a Talliaferro Designs kind of stitcher. I just love these designs. A very Happy New Year to you and your family. I am definitely a Talliaferro Design stitcher – the classic Jacobean crewel pattern has always been a favorite. I am thinking I would flip and invert the design to make it a 4-way pattern, with the pomegranates in the center and the leaves forming the corners. I have enjoyed following the Royal Persian Blossom “Share” Page this year. Happy Fourth Day of Christmas! Janet. I just love the Talliaferro Designs–they are so beautiful! I appreciate the Wooly supplies: we cannot find wool anymore in our area. I appreciate the .pdf on blanket binding from Wooly. Thank you. My absolute favorite – crewel work – and until I came across your website, I was stumped to find anything new or original. Thank you, thank you, thank you for sharing your contacts, expertise and your talent. I have never done anything “modern”. Most of what i have done has been in the Jacobean style. The Modern wold be an interesting exercise and the Talliafero would be amazing to do. Thanks for the possibility of winning. Thank you for these 12 days of Christmas give aways. What fun! Both types of embroidery are lovely but I definitely lean towards the Talliaferro designs. I love the Jacobean look of them with the fantasy flowers and sweeping curves. After browsing their websit I came to the conclusion that I would like to stitch all of their designs. Good Morning! I’m a Wool & Hoop stitcher … always looking for the challenge of a new stitching method. Thank you. Tallaferio style of embroiderer….for sure. More traditional…but enjoy stepping outside my comfort zone for some projects! I must admit I can’t decide which I lean towards. I like them both, and I like an eclectic life that lets you enjoy both styles. Don’t know which I identify with most. Different days, different interest. Would love to have a chance to work on both. I am a wool and Hoop girl. I do need to branch out. I am more of a Talliaferro design person. The wool and hoop is okay, but too contemporary for my tastes. In my eyes, the Talliaferro is ever so elegant and lifts my soul and thoughts to the beauty of God, even if the design itself is not religious. I am a Talliaferro kind of stitcher! I love challenging projects and the elegance of these designs. Mary you ask the darnedest questions! LOL The Talliaferro piece speaks “Deerfield” to me, while the Wool & Hoop screams for a wooly CQ project. I would probably start with Paradiso (classic, iconic) & change the neutral leaves to yellows to match my decor. Each visit to your site conjures up more new ideas! In that regard–I neglected to thank you yesterday for the link to Wormspit. He’s posted some fun stuff that merits future visits. Saganishiki has been on my bucket list for awhile & his beaded stitch markers would make a good program for a guild meeting. So thanks for posting–there’s lots of free “good stuff” every day, even without winning a giveaway! I never tried my hand on wool. Really wanted to try for a long. But need to finish my other silverwork and another Or’ Nue. And the next one will be Crewel even if I am not lucky to win this. I am definitely a Talliaferro design person. I like the beauty, history and elegance of the designs. What an interesting combination…but nice. I think I’m more the Talliaferro Designs type person. Not into “funky.” I like the finer more polished items. Thanks again for doing the 12 days. P.S. It’s amazing that you are receiving comments from so many places from all over the world. I love both, for different reasons. Wool & Hoop is closer to what I envision when dreaming to be an embroidery designer — playful and modern. Talliafero is awesome in their stitch selection and coloration, which is an area I am trying very hard to improve in. What a treat to have both in one offering! Interesting question — required a mug of coffee before I could figure out how to answer it. Hhhmmm…….wonderfully whimsical or wonderfully beautiful ? One of the great things about being a woman in 2011 is that it is not necessary to choose…we can to/be all! Love love love crewl. I think I am somewhere in the middle. There are days when I am just in a funky mood and Wooly Hoops fits in just perfectly on those days. Most days I lean more toward the traditional designs like Talliaferro. This is so much fun Mary. I look forward to your post every morning. I start my day with your post and a cup of coffee. I’m more of wool and hoop person, but i’m starting to do more complicated projects. I do love both kits! I’m a Talliaferro Designs type person. I like the more formal designs with the curving leaves and petals. I have been desiring a Talliaferro pattern for quite a while. I am a Talliaferro Designs type of person. I like the fine detail and vintage style of the designs. I am a wool and hoop kind of gal at this time of my stitching life. I identify with the artsy look – – Not that I have given up on the traditional embroidery – I will always embrace that – but I guess what I am saying is that when there is a time to break free – I do. that you offered yesterday. That would work!! I love to dream – sometmes they come true. My Grandmother taught me to knit. I remember feeling the yarn move through my fingers and across my hands. This felt so right! Later we moved to embroidery using the same yarns, so bold and powerful. I love that the giveaway swings between the ying and yang of crewal embroidery.The modern and the past are so nicely captured with these, my favorite is the contemory. For my grandmother it would be the Talliaferro. I love, love the Talliaferro Design piece! I am delighted to now know of their website. I have often been on the Wooly Thread site which I also love! I have a hard time with the idea of choosing, but I’m leaning toward Talliafero. I like the blend of design and color with the example I saw. I would say that I’m more of a Taaliaferro Designs kind of stitcher. I love the elegance, and the more regal feel of it. Mary, I am a more traditional type of stitcher so the Talliaferro is the one I am drawn to. I love to kow the background of certain types of embroidery so this is much more intriguing to me. I am loving the give-aways. Lots of fun. Blosson is one I have been wanting to do as my daughter recently married. Her husband is Persian and I would like to work this kit as a gift for them. I think I’m more Talliaferro–but am willing to try anything. Thanks for the chance to win this great gift. Hi Mary and thanks for another contest! I like both types of stitching styles. For me it’s all about the process. It’s fun to work on different styles of stitching or with different materials. I am a Talliaferro Designs kind of stitcher, I like traditional. I’m much more a Talliaferro type. I don’t really like the primitive designs. Thanks again for another WONDERFUL giveaway. I love this giveaway, because crewel embroidery is one of my favorite types of embroidery. I took your class, The Nesting Place, which was done with such wonderful D’Aubusson wool that I just had to order a whole collection of it. I’m definitively an Talliaferro Designs person. I like classical and elegant designs. Being a fan of Jane Austen, it’s not surprising! I would LOVE to stitch that chart! But it would be fun to work on the other too! Thank you again for the giveaway! I am most definitely a Talliaferro Design person! I love the design, colors and classic look. I don’t know if that describes my character or style but I tend to be more traditional than contemporary. Thanks for all these wonderful giveaways! What fun it has been each day. I guess I am a Talliafero girl, I haven’t done much crewel work,(but would like to learn, that is the one that speaks to me. I am more of a Wool and Hoops type stitcher, but I aspire to Talliaferro. I am getting more patient, which is all something more complicated needs. Beautiful! wow how interesting, love the look of both of them, although I am more traditional I love the fun designs..thanks for the opportunity.RebeccaK. This is an unusual giveaway… I have a small stash of Appleton wool and would love to use it. The Talliaferro Designs are very attractive, I think that would be my first choice but I will try anything… it is the spice of life isn’t it. I’ve done crewel work since I was 9… I would LOVE to get back into it again a few (ahem!) decades later! I think that I identify with both styles to some extent – there’s a little bit of funky fun in me as well as a bit of the more serious and fancy… I would have a hard time picking which one I would identify more with because they are both beautiful in their own way!! I love the complexity of the Talliaferro design and the simplicity of the Paridisio. Mary, I’m the kind of stitcher who has several projects going at once, as I’m sure many of your readers do. I live the complex ones for when my brain needs stimulating and the simple ones for lazy times. I do a lot of needlepoint and I love working with wool. My daughter has a birthday coming up and the Wool & Hoop card would be fun to make for her. I really appreciate your articles and save many of them for future reference. Hi Mary, sometimes I like the big, bold, funky designs. I am attracted to (and would like to be) more of the devil-may-care type that is often embodied in these designs. In some ways the more refined designs are easier because you know how it’s supposed to look and when you’ve achieved it. It’s harder to work on something that allows more self expression and letting-go. But, The colours and design of the Tallioferro design is what is most attractive to me, all that being said! Mary, I like both designs. Sometimes a quick fun project is just what a sticher needs to get a break from that piece that’s been in progress for who knows how long. But the design and colors of the Talliaferro design are gorgeous. Not much of a crewel person, both of these would be a great introduction to the technique. Thanks! My Christmas present to myself was to finish the Talliaferro Royal Persian Blossom. I loved every second of working on the piece. I was never bored as the constant change of stitches, thread colors and design sections kept it interesting. It was the first time in my life when I did not get the “I want this to be finished feeling when I was about 85% done.” Now that it is finished, I miss working on it! I love the more traditional crewel designs but have found it is good to try different things now and then just for the experience of doing something out of my comfort zone and learning something new. I am not sure which of the two I am or feel closest to. I never did Embroidery before but I would love to give them a try. Thank you for the chance to enter in the give-away. I guess I am a “both” person. I love the Talliaferro designs. Elegant and technically challenging, suitable for a long, slow and delightful endeavor. However, sometimes I just don’t have the time or the patience, so the quick and easy kit, like the one from Wooly Thread would just fit the bill. I know the Wooly Thread is contemporary, but for an old embroiderer like me, it also reminds me a lot of the the 1970’s designs. In a good way of course. Over the years, I have tended to be attracted more to traditional designs like those produced by Talliaferro Designs. Lately, I have been loosening up a bit and drawn to the the funky side of stitching and quilting. Maybe, I am finally learning how to have fun. I’m a Talliaferro Designs kind of stitcher and I love the colors in the Talliaferro design in your contest. Personally, I prefer the Talliaferro Designs, but I also enjoy “wool and hoop” especially when I’m looking for a quick and not so carefully executed project. Every time I put needle to fabric I’m happy! Thank you again, Mary, for this 12 days of fun! I haven’t tried a Wool and Hoop design so I’m not really sure. I am more the Talliaferro Designs type of gal, the simple elegance of the designs really speak to me although I also like a little whimsy here and there in our home. I’m definately a Talliaferro Design person. This new one is very pretty and would look wonderful on my bedroom wall. It would also be a challenging project to enjoy! I am definitely a Talliaferro Designs kind of stitcher having just about finished a crewel work picture for the first module of the Certificate course with the Royal School of Needlework in the UK. I would love to do another design and this one looks like lots of fun to do. I would have to identify with the Talliaferro Designs kind of stitching. It would be wonderful to win these. It has been years since I have done any crewel and I don’t know why. Thank you Mary for the opportunity you are giving all of us with this wonderful 12 days of give aways. I am definitely a wool and hoop kind of stitcher because I tend to sew while waiting on the kids activities and this is the kind of stitching I can do on the fly without a ton of concentration but I am always up for a challenge of learning a new to me way of sewing! For a long time I would have said I’m a Talliaferro type – and for the most part I am preferring traditional designs. However, lately I’ve tried a few modern, whimsical designs and have really enjoyed those too. So… I would have to say I’m both! I think there is a bit of both in me. I love doing small simple designs, especially when teaching my two granddaughters the delights of embroidery. I also love the challenge of a difficult piece, learning new stitches, and the elegant look of the finished piece. Would certainly enjoy this give-away! It would definitely be theTalliaferro Design kit, Paradiso I. Anna’s designs, colors, and web site, stand alone. I am more a Talliaferro type of person, but occasionally I enjoy the less formal pictures of the Wooly, especially for small things like birthday greetings or children’s pictures to teach beginners. So which am I? I would definately say Talliaferro appeals to me more. I think that is the kind of embroidery I have always dreampt of being able to do. I learned the easy stuff as a young girl, but stopped for a long time, now you have inspired me to try to master things like the design on the Talliferro design. Thanks again for the inspiration and the how-tos! I would like to say I am both, but never seem tohave time for “quick” projects – too much deadline pressure, I guess. I tend to be a Talliaferro kind – long, complicated, involved and engrossing – that get given away “sometime” when they are done! i am a talliaferro designs type. the wool and hoop design is quirky and would probably be fun to stitch up. i like the challenge that the talliaferro would offer. i’m sure i would enjoy them both. what a nice giveaway. thank you for the chance. I think that currently I am a Wool & Hoop sort of stitcher, but I have hopes and dreams of becoming a Talliaferro sort of stitcher. By that I am mean that right now I do mostly simple and quirky but its the richer, more elegant work that makes me want to keep learning. Definitely a Talliaferro stitcher.Wool & hoop is not me at all. What a lovely gift this would be. I’ve never worked with wool before so the Wooly Thread package would be great for getting started. But I think that I’m a Talliaferro Designs person – the designs are so elegant and the coloring is wonderful. I am very much a Talliaferro person. The traditional style and colors appeal to my romantic side, whereas the Wool and Hoop kit reminds me of ’60s and 70’s design patterns. I guess I would say both styles represent me depending on the mood I am in. This gracious giveaway shows the range and evolution of embroidery! Call me a Talliaferro type, though I’ve been known sometimes to try a less traditional approach. Thanks for the contest! I can´t stay away for yoiur 12 Christmas Day!! This time I am like more Tagliaferro … is my kind of embroidery … I work with wool/hoop too … but …. Paradise I catch me!! .. I am in love today!! Thank you!! Mary I feel like I relate more to the talliaferro designs…love them both but definitely the talliaferro. By the way it is a beautiful design! I do love the elegant but everyone needs a pinch or two of whimsy. These almost look like punch needle. I have to look through your site and see if you have any posts regarding punch needle. I would like to try it but I am unsure which needle to buy. If we could all figure out a way to make more time… I am already pushing my “day” to the ultimate! I know that I am definitely a Talliaferro Designs kind of stitcher. I love all things classic and elegant. Mary, I must once again thank you for running this series of giveaways. There are going to be some very lucky stitchers when the winners are announced! I haven’t done a lot of the crewel work, but what I have done I really like. I did a seashore scene with lots of little sea shells and it came out very pretty. I would like to do more crewel work and maybe, if I’m chosen for these kits, it will get me started. I do like the Royal Persian Blossom the best. I’m not much for “whimsical” when it comes to creating with threads. Thanks again Mary for having these 12 days of Christmas giveaways. It’s been fun! My taste is for the more elegant and complex designs of Talliaferro, but my experience and skill level is probably more suited to the Wool & Hoop designs. Perhaps they are a good “warm up” for the Talliaferro pieces. I like the fun and modern feel of the Wool and Hoop, AND the elegant elaboration of the Talliaferro. I’m a very eclectic person and like a little of everything! I think the Talliaferro wins out, though. I would love to be able to stitch that up! I have stitched a couple of Wool&Hoop kits–I like their modern style. It’s deceptively simple. (I tried to design my own in that 50s modern style and was not at all successful.) The kits are great with plenty of thread and good instructions. But I really love Talliaferro designs and Ms Gosier’s unique color sense that really makes them pop. When I first saw her designs my jaw dropped. My problem right now is settling on a design to stitch. And, as an addendum, Wooly Thread is the best. I’d be lost without Jan-Marie. What great designs. I love them both. The Wool and Hoop design is adorable and one that would be great for my granddaughter to stitch as a first project. She is 12 and is just starting to get interested in stitching. She crochets with grandma, but this would be great for a first project; and I love the Talliaferro design. The colors are wonderfully soft and bring out the beauty in the design without overshadowing it. Great picks Mary. Love your newsletter too! Crewl embroidery is beautful in either style. I would say the Talliafero is the one with which I am most familiar. As a gift, I would be truly blessed with either of the projects. Crewel work is definitely on my list to try, I have bought a couple of books on the subject recently and would love to give it a go. The Talliaferro design is definitely my favourite but the Wool and Hoop kit looks like an excellent place to start. Hi Mary, I think the Talliaferro Designs are absolutely gorgeous and they definitely resonate with me. I love the more classic designs and see lots of history in them. The colors are lovely as well. Both kits would be fun to do and present a learning opportunity. Thanks! Thank you so much for these give-aways. What a nice thing to look forward to in the morning – just like your newsletter! I am definitely a Taliaferro design person, rather than a wool/hoop person. So far, I’ve only done ecclesiastical embroidery with silk, and Trish Burr embroidery with DMC. I have been wanting to try crewel, and a kit that requires a variety of stitches, not just the satin and stem stitches that I usually work with. How home-y and comforting these designs are. They are almost a retro country chic take on everyday patterns! Wool and hoop for me! Just this summer I started (and more importantly, finished) a wool sampler. The wool took a bit to get used to but I really enjoyed it! I think I’m more of a Wool & Hoop kind of girl. I love the Talliaferro (it is stunning) but if I have to pick I am W&H. I like both styles. They’re a lot like me. Somedays I’m in a funky free form kinda of mood and then other times I’m totally structured and traditional. I’m more for the Talliaferro Design type than the Wool and Hoop. I like the elegant look and the intricate designs. The candles would make a nice B-Day card though – for a special “funky” person. What great kits! Such a good idea to have both of them together too. The first one is so cute and doable – you could finish it and refresh your skills working with wool and then move onto the Talliaferro Design one! I am drawn to both – the first because it is fun and would be more likely to be finished. The second one appeals to me though too because it is more complex and looks like more of a challenge. I think I would be considered a combination stitcher. I definately enjoy needleworks from all areas. I’m drawn to the blue design but I think the birthday design looks like it would be a fun project. I have done a little wool and hoop things but i am a beginner. I haven’t done the Talliaferro yet but it is gorgeous. The colors on the design I saw would look great in my bedroom. I love the folks at Wooley Thread. Both kits are unique in their own way and for different purposes. The Talliaferro Design is more challenging and traditional. That would be the most like me. The Wool and Hoop is fun and youthful but, alas, I am only moderately fun and not even moderately youthful. I love crewel work. It’s my favorite type of needlework. I love the Talliaferro design, but the wool and hoop looks like so much fun. Perhaps I can interest one of my daughters in learning to do crewel work! I’m a typical Pisces, swimming in opposite directions. Though I prefer the Talliaferro design most of the time, I am not immune to experimenting with funky, happy designs. I lean more towards Taliaferro but get in the Wooly Hoop mode too. I like a quick project and I have a niece who would love the card. The Taliaferro design and colors are wonderful. In fact, I have a little design that is the last square in a large sampler. I couldn’t decide on the colors and now I have them. Thanks for these fun giveaways! Thank you for the chance of this generous giveaway and have a Happy New Year! What fun! I’ve actually been to the Wool & Hoop shop in Marfa, TX and talked with the owner/designer, who is just delightful. I WANT to be a Wool & Hoop kind of stitcher, but I think I’m more of a Tallioferra Designs stitcher. Guess I’ll just have to work on being more of a “contemporary” stitcher to be more comfortable with it, while continuing to love the more traditional designs! Thanks for another fun day! I am a whatever mood I am in kinda stitcher. Both projects look awesome! Actually I tried crewel work about 30 years ago. Then I was into more whimsy but now I’m drawn much more to the Talliaferro design and am looking forward to trying crewel work again. The blue color really appeals to me. My favorite kind of embroidery. I keep branching out and challenging myself with various types of embroidery, but I always come back to wool crewel. I am more a Talliaferro-type person, but I’ve certainly done my share of funky designs! This giveaway is lots of fun – I can’t wait to see what’s coming next! I’m definitely a Talliaferro Designs kind of girl. I love the complexity, and a long project doesn’t daunt me at all. I am more of Talliaferro design kind of stitcher. I am a Taliaferro Designs kind of gal: meaning I really enjoy the classic crewel designs. That doesn’t stop me from trying something new and different, so this give away appealed to me. Thanks. The patern is exactly what I need on my wall. Would be a great way to try something different. Wishing all of you a happy, healthy, safe New Year. Definitely Talliaferro… but it would be fun to try something new. Crewel embroidery is on my ToDo list but I never seem to start anything. This might just be a turning point in my projects. I am a Talliaferro Designs type of stitcher. I appreciate their classic appeal and medieval style and colours. I love both! I’m a needle person and it does not take much for me to like most needle and thread work. It just speaks to my head and heart. I am a bit of a “wool and hoop” kind of girl, as it is a bit quirky and ‘out there’ and I like embroideries that are a bit different. I also like the idea that it is quick as well! I would love to be given the opportunity to stitch it and then go onto something more challenging like the Talliaferro, it is beautiful and elegant, which I also like in my embroidery. The Bayeux Tapestry with ships is almost done; meaning I am not a stranger to crewel work. It also means that I don’t ever want to do another wool boat! But that does leae me in a quandry over your question. The Bayeux seems to be in the midrange between your examples, leaning a bit more to the Wooley Thread example. NO, I’m in the middle! I’m def a Talliaferro sort of person. I’ve just finished the Royal Persian Blossom which is getting framed as a Christmas Present. I am definitely a Talliaferro person. I love the texture and dimensional quality you can achieve in crewel work – when I was a girl I was always doing crewel work fussy animals – like squirrels with bushy tails. Someday I hope to be good enough to actually do stump work that looks mostly good!! I have never really done crewel work l but I would be a Talliaferro Design stitcher. Crewel! Something else I’ve always wanted to try. These are great kit sets and I’d love to win them! I am more of a wool and hoop kind of girl. Love the whimsy of the look and the natural look of wool. Not to say I wouldn’t love to try the talliaferro design. Because after all, stitching is fun! I’m drawn to the Talliaferro, the elegant look and the challenge of the stitching. Again, this would be a stretch for me, but a good one. I loved the look of the Persian blossom, but feel that it’s a bit too far above my abilities at the moment. I have not done any crewel so I have no idea which I would prefer. I believe that I would enjoy either immensely. I would love to have the opportunity to try crewel. Thank you for the chance to win! ~Amanda H.
I think I’m probably a wool and hoop girl, but there’s no harm in dreaming about the beautiful Talliaferro designs is there? Mary what a gorgeous selection once again. I love the Talaferno type of stitching but have done mostly three dimensional crewel from the days of home parties with needlework designs. I would love to try a talaferno design, and wonder if anyone knows of a resource in Nova Scotia, Canada for good threads such as wool threads and the gorgeous reels of flat silk. Happy 4th Day of Christmas. Another exciting give a way! I must admit that at first I was going to pass on entering for the items for today. But, Mary, you always post links and strive to help educate. So, I clicked on the link to Talliferro Designs. WOW! Another world has opened up yet again. It did not take long to fall in love with these designs. What a beautiful form of embroidery! It is truly stunning. What I love best is how they show one to take a design from anywhere, isolate a portion, and manipulate it around. Exactly the type of thing we learned in design school. The history of this type of embroidery is fascinating to learn. The other thing that enchants me is the fact that it would make working up large designs much faster than using silk. Thank you for continuing to open the doors to this fascinating art form! I have done a few Crewel pieces and love the process a lot. I am attracted to the Talliaferro piece first because I am a nut for their ‘blues’, however, yesterday was a special birthday in my house, so the Wooly piece draws me also. I have the Rooster pattern you gave us Mary to crewel up in the spring. This 4th Day of Christmas is, AGAIN, very exciting!!! Happy 4th Day After Christmas! Love this giveaway! I am a Talliaferro Designs kind of stitcher simply because I like the more elegant look of those kits. However, I have to also admit to never having done crewel, and do like the kind of funky look of the Wooly Threads kit. Would love to give that a try. Thank you so much for doing the 12 Days of Christmas giveaways. And I’ve been looking through some of your embroidery designs and lettering tutorials–plan on using them in the near future! Definitely I lean towards the Talliaferro design…the detailing on it is what draws me to it. I am definitely a combination of both of these crewel work styles, but I lean more to the Paradiso I project when making something that I plan on displaying in our home. The Wooly Hoop pattern is in a book I took out of the public library last year. I used some of the patterns in that book for little gifts for my granddaughter’s teachers. Hello Mary and a Happy Christmas for you! I am a crewel embroiderer, and I believe that although crewel embroidery lends itself to the magnificent modern designs as the ones in the Wooly Thread, it really shines when you have the intricacies of Jacobean and Elizabethan flavored designs. I am a big Jacobean-style embroiderer and since I discovered the magnificence of wool, I can’t get enough of it. It really just doesn’t look as good in any other but a nice tapestry or crewel wool. I am currently working of Flutterby, a design by Jane Rainbow, from her book The Beginner’s guide to Crewel Embroidery. I’m a Talliaferro Designs kind of stitcher, absolutely! I love the design!!! I am a traditionalist when it comes to crewel embroidery. While I do stitch all types of embroidery techniques, it is when I come back to a new crewel project that I feel I am truly an embroiderer. Um um um… I am probably more of a Talliaferro Designs kind of stitcher I think. Love beautiful classic style designs although I am also a sucker for 70s designs as well! No doubt about it, I am totally in love with Telliferro designs! Whenever anyone one in my family sees a Jacobean design, they say it looks just like me. But I will admit, the Wool and Hoop kit looks like it would be a fun change of pace. I guess I’m more of a Talliaferro design type, although the freedom in the Wool & Hoop is great for more creative projects. Right and left brained??? Probably a mixture, depending on the subject matter and the type of finished object it will be. Definitely a Wool and Hoop girl. I bought The New Crewel book a couple of years back and still love the designs (including the candles in this kit). I am in love with both, and thank you for bringing attention to them. I think I am a combo stitcher. I love the funkiness of the Wool and Hoop kit and the elegance of the Talliaferro Designs. Thank you for doing this 12 Days of Christmas. Just seeing the give-aways is like opening gifts. One of my primary resolutions for 2012 is to stitch on something 5 days out of every 7.These give aways are an inspiration. I’m a combination kind of gal: I’d like the wool and hoop for a quick, fun project, but when I want something more involved, then the Paradiso design would challenge me. Thank you for the opportunity. I gravitate towards both of them equally. I was not aware of the two designs by Talliaferro until your posting–much thanks as classical crewel more interesting to me. Very definitely Talliaferro, who I believe are THE best crewel designers currently on the market. I also love Appleton’s crewel wool, which I’ve used since I was a small child in the UK. There are finer and smoother crewel wools, but the colour range cannot be beaten! Thank you, Mary, for this lovely give-away! I had already left a comment but it seems to have disappeared. Here it goes again. I love Talliaferro and have already bought the previous project. The colours are soft and so well matched. In particular I love the blues. I am an embroiderer and I love the Talliaferro designs! I would like to try both of them! Thanks for the postings and give-aways! Definitely a combination of both! Love the convenience, not to mention the whimsical nature of the Wool & Hoop kits (what’s not to love when everything you need is right there? ), but when there’s all the time in the world I’d enjoy the beauty of the patterns and enjoy the hunt for the perfect threads from my own stash. Mary: Thank you for this opportunity. I must say that the crewel designs from Tallifero are right up my alley, so to speak. Their website is quite intriguing and I am happy to learn about it. The Wool & Hoop offering is funkier and probably takes more imagination than I think I have. But I would love to try. Hi Mary, you have some lovely prizes in the 12 Days of Giveaways, thank you for organising this, and thanks also to the lovely people who have contributed prizes. So, “… are you a Wool & Hoop kind of stitcher, or a Talliaferro Designs kind of stitcher?” I think I would be both. I have not tried crewel work, so I am only basing my answer on my reaction to the pictures of the kits. As with most things, I like both varieties of kits. The Wool and Hoop kit looks like fun and the Talliaferro looks like a challenge! OK – first of all, I’m glad to find out that the first pattern is birthday candles. I’ve wanted the book it came from and I thought they were abstracted trees (really). The second kit is gorgeous just looking at the packaging. Thanks for doing this Mary! Hi Mary, Thank you for all the fun you are giving everyone with all these beautiful give aways. I’m really interested in learning more about Talliaferro! My stitching has been in the type of Talliaferro Design, I have never sititched one of their designs. It is always good to change pace and I do have some whimsial sittching projects that bring a smile to my face. The Birthday Candles will be one such project. I have been wanting to home my crewel skills for some time. I fell in love with the Persian blossom design when I first saw it on your site. I would love the chance to work with it. I’m more of the Talliafero type, but the wool & hoop looks like fun for some of the spring birthdays in my family. I like both styles. They are different, but both are fun to stitch! I never try crewel embroidery. This would be a first for me. The first kit look fun to do. The second one seem to be a nice challenge. I have never tried either! Would love to! If these were to be gifts, I would have to think about the personality of the person receiving it. That said, sometimes it can open a persons eyes to receive something unexpected. I like both kinds of designs because I like the texture of wool. Like silk, long history and lots of different uses. Years ago I used to do a lot of crewel embroidery from kits, mostly Erica Wilson. When you introduced us to Talliaferro a year or two ago, I was drooling over Anna’s designs. Would love to win one of her patterns! I particularly like crewel work. I love the texture it produces and so Paradiso 1 would be the ideal kit to do. I love the idea of the wool and hoop kit – I would like to add this to my sewing basket for a weekend retreat! I’m a Talliaferro Designs kinda gal. More complex, but not as many curves as I used to have! Looks like another fun gave away. I love crewel but it has been a while since since I’ve done a project. I like both designs, I would try the Wool & Hoop design first as it looks easier but I would love to be able to learn how to embroider the more complex Talliafero design. Your blog and website has opened up so many ideas and hopes for me and needlework. You have really inspired me to reduce my stress and pick up my needle! But I haven’t ventured as far as crewel work yet. If I were to win today’s offerings, it would be a wonderful introduction to the art form. And a great beginning to the New Year! Hi Mary, I would love to be able to have a go at the Talliaferro Designs kit – it would be a challenge. Thanks for the chance to have a go. Definitly a Talliaferro Designs kind of stitcher. Crewel work in the late 70’s was what I started with. I’m definitely a Wool & Hoop kind of girl (I’ve ordered from her several times)..I usually enjoy more contemporary embroidery and find it whimsical and imaginative. That being said, I would like to try something more traditional since variety is the spice of life and I think it would challenge me more. Crewel work is my passion and the Talliaferro designs are the heart of my passion I would give my eye teeth for this design. Anna’s designs are the best new crewel work designs I’ve seen in ages, I love them. I’m still so new that I am just practicing basic stitches. The Wool & Hoop one is cute but the beauty of the Talliaferro Designs wins over my sense for beauty and elegance. I love crewel and l love them both, however the “old soul” part of me is drawn to the Talliferro design! I would love to see a pillow made out of it!! Pick me, pick me!!!! Love both. The Tallifero is beautiful. the colors are spell binding. On the other hand the Wool & Hoop is a quick way to get your crewel fix. I love working with wool I would like th Talliferro design. 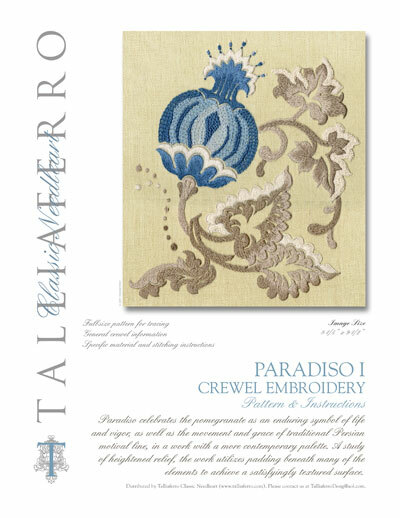 I love the Talliaferro (Paradiso 1) – so elegant – love crewel work. I just love Talliaferro design, more like traditional crewel but more complex! Wow every day more beauties!But this time I would definitly like Talliaferro Designs! thanks for the chance to win! I have discovered that I am more of a traditionalist, so the Talliferro design appeals to me more. However, I try to dabble in contemporary every now and again as it does appeal to the younger generation, and some amazing things can be made! I love both the variety of stitches and complexity in the Talliafero designs and the wool & hoop contemporary designs. I have done only one crewel project so far, but I believe I am a Talliaferro Designs kind of person. I love the elegance of their designs. I would love to be picked for this give away. I am a Talliaferro Designs type person for sure. No doubt about it. I love that traditional style. Thanks for day 4, Mary! I love talliaferro so much …. wish I could win. Hi, Mary. Definitely a Talliaferro girl here, but I love the linen twill carried by Wool & Hoop; it’s nice and substantial. Thanks for another great giveaway! I lean more towards Talliaferro Designs, but I could envision some fun uses (throw pillows, maybe?) for the Wool & Hoop projects. Interesting question! So far I have been the Wool & Hoop kind of stitcher because the only crewel work I’ve done has been for little kids. I did Christmas ornaments, small pictures for their bedrooms. However I would dearly love to try something more elaborate, more “grown up”. I’d like to do a project where I could learn something new from each portion of the design, whether it be a new stitch or just a good dose of patience! I think that’s where the Talliaferro design could serve me well. The Talliaferro design looks like fun and would probably be the one that would actually get done. Wool & Hoop appeals more the my asthetic side though. I really would like to try making something in wool threads. Thanks to all of you for offering these wonderful new items to learn from. Your question was are you a Wool & Hoop kind of stitcher, or a Talliaferro Designs kind of stitcher? Or a combination of both? Honestly, I don’t know, because I have never stitched in the styles above, but the second kit, the Talliferro, is nearer to me, I think. I think I am a Talliferro type embroiderer but I want to be more free like the Wool and Hoop. I’ve never worked with wool and would love to give it a try. The wool and hoop, which I could not help but smile at, would be a great starting place. The Talliaferro design made me think that something magical was about to happen, like in Cinderella. Come to think of it, needlework is some beautiful magical art. Never done any crewel before and the Talliaferro caught my eye as something I would like to try. My grandmother did crewel work I loved the look of it and always wanted to try this would be a great time to do so.. Thank you for hosting this great giveaway..
I’m definitely more of a Talliaferro type of person. I like the elegant Jacobean designs and am somewhat interested in historical embroidery. I especially love the blues and tans on the designs. Another awesome day of prizes!! Thanks for the opportunity to enter. I think I tend towards the Talliaferro type of embroidery, but I do like the occasional quick and funky style for a light relief/travelling project. Oh I am definitely a Talliaferro kind of person! What a GORGEOUS website! I have bookmarked it so that I can sit down and read it all at leisure and will definitely be ordering a pattern. I love the history and style of crewel work. I love the Talliaferro designs the best. I love the classic look of them. I am dreaming to be able to stitch them. Whether I am a winner or not in this 12 days contest, I just want to thank you for re-kindling my desire to do crewel embroidery! I did my first piece well over 40 years ago and that pillow still sits on a chair in my livingroom!! But acquainting myself with the Talliaferro site my soul absolutely calls out to complete a crewel project. I like the design you are giving away, but I would love brighter colours—being a Jacobean Crewel enthusiast,I am drawn to those designs that are in Gallery 4 and 5, especially “Thistle Down” and I must say I would love to see “Turkei Bouquet” that is in the Works in Progress section, completed one day. So no matter what I shall bookmark this site and will definately purchase a pattern one day. Thank you so much once more for your inspiration. I love the look of the Talliaferro Designs piece, but I’m definitely more of a Wool & Hoop gal. I love the quirkiness of the design. Although my preference would have to be the Talliaferro type of Crewel, I just realised I hadn’t ever tried something really fun like the Wool & Hoop kit. If I’m honest though,this new Paradiso 1 being a little more simple than their usual designs, would be a real treat to win. Exciting! I tend to be more of a Taliaferro kind of stitcher. The Taliaferro designs are so elegant. The prizes are certainly generous! I’m loving the 12 days of Christmas! As weird as it seems, I’m a little of both as a stitcher. I love to work on things that are unexpected and original, like the candles from Wooly Thread. They are fun and lighthearted. But at the same time, occasionally I like to work on more “serious” projects that take more time and require more effort. The new Talliaferro project is gorgeous! I love all of the chainstitching and the color combinations! OOOOOO, um I guess I fall somewhere in the middle. I aspire to be a Talliaferro stitcher,but I’m not there yet. And I wish I could be as free and whimsical as the Wool and Hoops designs. As for which one of these two appeals to me more, the Talliaferro(her designs amaze me). Love, love, love Crewel Embroidery!! I am a Talliaferro type, but Woop & Hoop is great fun and definitely adds more to the “look how much I am accomplishing without the stress and concentration” factor. Since I so enjoy stitching with wool, I would be so thankful for either one. I would like to think that I am the Talliaferro type of embroiderer–because I think those designs are so beautiful–but my style of embroidery probably tends toward the wool and hoop type which are more spontaneous looking than the other. It would probably be good to discipline myself to do real crewel work. Oh, I’m most definitely the Talliferro type of embroidery. Elegance all the way….. I am draw to the fine stitching of the Talliaferro crewel embroidery style. Oh yes, I should like to try the Talliaferro type of embroidery very much!!! Thanks for the opportunity and a Happy 2012! As a beginner stitcher, I am more of a wool and hoop type. I wish I can advance to do the more sophisticated work of Talliaferro design one day. I have always been a Wool and Hoop crewel stitcher, but would really love to try the amazing Talliaferro Design!! Wow! I’d say I’m more drawn to the Talliaferro than to Wool & Hoop, although I do like some of their designs and they seem quick and easy. I haven’t done much if anything in the line of crewel embroidery, so Wool & Hoop seems like a really good place to start. I love the elegance of Talliaferro though. NICE!! While I have really only done the Wool & Hoop variety of crewel, I reaaallly love the Talliaferro type, it is just gorgeous. I love the ease of the Wool and Hoop type of crewel work, but would love the challenge of trying the Talliaferro type. But both are very nice and you continue to keep me in suspense for what may be next! I commented earlier today but it must not have gone through. Merry Christmas everyone! Skillwise I am more of a Wooly Thread girl, but I aspire toward the Talliaferro designs. I love the Jacobean designs and the lovely colors. The Wooly Thread kits are simple, so simple that my toddlers can help me with the stitches. I am sending this comment again, because the first one came back as invalid email address. If I was going to purchase an embroidery project it would definitely be one of the Talliaferro Designs. ooooh I like both Wool & Hoop and Talliaferro Designs. My talented students who discovered the wonderful range in ‘the world of embroidery’ this year are so varied in their embroidery interest and skill, that either design would add discussion and more ooohs and aaahs to the class room. We started to walk along the challanging ‘path’ of crewel embroidery only a few weeks ago. My style is more along the Wool line but the Talliaferro design is the cool poise person I would want to be. In reality, I love the birthday design. It is so simple and cute. Pick me, pick me! I’m a Talliaferro kinda girl, traditional and classic. But, if there is a Wool and Hoop twist in the design then I love, love, love it because I like things that are clever and interesting. I think I lean towards being a Talliaferro Designs type of stitcher, although unusual modern designs do frequently catch my eye so maybe it’s a bit of both! I am definitely Talliaferro type. I think that particular design is absolutely lovely. I really like both kits. I would use them for two seperate reasons. the Wooly Thread one is cute for my family room or a gift and the Talliaferro would go great in my living room. I love Talliaferro Designs the best, I think they are romantic, have elegance, a bit Victorian. I would call myself more of a Talliaferro type of stitchers. I like the more classic look. It doesn’t look so modern. These are beautiful kits. I would love to have the chance to experience 2 crafts that I have only dabbled in to this point. In my self-delusional state, I would tell you that I am a Talliaferro type of gal. I love the result. In my non delusional state, I would tell you that my ability should start me out at a wool and hoop project and work up to the Talliaferro. Ah, but a girl can dream, can’t she? I am most definitely a Talliaferro Designs kind of stitcher. Beautiful, heirloom type pieces are my most favourite to stitch. I like the challenge that they give me, and hope that they are a type of legacy that I can leave behind. I just put a crewel embroidery book with the above wool & hoop design on my wish list at amazon! I love both designs, but if I were to make one, it would definitely be the Talliaferro. I’ve done loads of embroidery over the years, but have gotten away from it in recent years (having kids can do that to you). I always like learning new things and the Talliaferro looks much more challenging and might possibly have some stitches I haven’t mastered yet. Thanks! I lend to like the Talliaferro Designs best and would love to work one, but there are those days that I want something easier to do and would fall back to that. I like the wool and hoop as you can take it wherever you go. I go to a Senior group and take things that I can pick up and work on at anytime. The Wooly Thread is a great place to get patterns, wool materials and Appleton thread. I have been with her since she started many years ago. The appleton wool is a good thread to work with, it does not bother my hands as other wools do. I love the Talliaferro Designs and am half way through the Royal Persian Blossom after purchasing the kit from Wooly Thread. I think I am a dual kind of stitcher although perhaps a little lean further to the Talliaferro type of design. I like the Wool Hoop style because it is fun, simple and fast which is always handy to do. I do love the Talliafero type designs for their elegance and a bit moe of a challenge even though they are quite “doable”. I really love to do just about any type of stitching! I am a new embroiderer. I wouldn’t call myself anything but a learner! But I want to be the kind of embroiderer who does the Talliaferro Designs kind of stitching. There’s just something about it that screams amazing! I think I am both a Talliaferro Design and Wooly Thread design girl–probably a bit more urban like the Wooly than the sopsticated look like the Tallifaferro. Hey, I’ve done both and love both. I have the Wooly book and totally love it! Thanks for the chance at the 12 days of Christmas Mary! I love the whimsy of the wooly kit. But I’d like the second kit better because of the skill level and challenge it offers. As I am very partial to crewel embroidery I found the Paradiso I design particularly elegant. The Talliaferro Designs are lovely in design and colour selection. I think it would be a welcome challenge. I’m a combination of both. Day-to-day I’m a Wool & Hoop kind of stitcher. For special occasions I’m a Talliaferro Designs kind of stitcher. I adore the Taliffero designs as they still have the feel of old crewel work but with a beautiful modern twist. I would say I am more the Wool and Hoop type. The other one, while beautiful, looks way too advanced for me. I’m probably a combination of both, but I tend to be drawn toward the more complicated pieces like the Paradiso. It might be beyond my skill, but I’m pretty good at figuring out directions. The Wooly Thread kit would appeal to me when I want something a little simpler and quicker to work up. One inhales deeply and then murmurs “Ahhhh!” upon viewing the Talliferro designs. The Wooly Threads provides the encouraging stepping stone to the entrance to Talliferro. Both websites are such a treat that I now look forward to tomorrow”s offer, just to see some new wonders. Designers, thank you for your contributions, and thank you, Mary, for featuring them. Mary I am not sure which one I like more but would like to go with Talliaferro designs. I did a lot of crewel work many moons ago – I was a keen crafter when I was in my teens which was when crewel was last in vogue. Today the patterns have evolved and I would have to say that the Tallaferro type of design would intrigue me the most. Truth be told, I don’t know what type of project is for me and my stitching. If I win, I am sure to find out and look forward to a new challenge! The Wool & Hoop kind of stitching is what I used to do a lot of years ago. You’re probably too young to remember, but embroidering funky designs on jeans, jean shirts, jean skirts, and jean jackets was such a groovy thing to do in the ’70s. It’s still fun for little projects. But the Talliaferro Designs! Now, THAT kind of work is what a true lady must aspire to! Right, Grandma Jeni? I have worked a little with wool, but I would identify myself as a Talliaferro Designs kind of stitcher. Thanks Mary, Happy New year to you and all fellow stitchers. I am more of a wool and hoop type of girl. I just love the look and love the folk artsy designs. Thanks for the lovely giveaway. Talliaferro is more my style. I am interested in historical embroidery techniques. While both kits are really cool, I am definitely a “Wool & Hoops” type. I love designs that are just a little odd and quirky. And if I can figure a way to make it even quirkier, I will! The 12 Days of Christmas are looking better every day! I’ve never done crewel work. If I win one of these items, I’d love to include them in the stash replenishment donations being gathered up by K.N.A.S.S. for the folks who lost their homes in the Bastrop, Texas, wildfire this past September :-). I have to say that I’m a challenger, the one that starts at the top and then works down. So the Talliaferro design would be my cup of tea. Absolutely the beauty of it is so inspirering. Loooove it. I lean more to the Talliaferro Designs, I have always loved Jacobean since I was young. Yum, love this type of embroidery I have done both “Talliaferro” and have been a “Wooly hoops girl” and have really enjoyed doing both allthough drawn more to “Talliaferro”, in fact I have a crewel project on the go at present working with Appleton yarn. I would be thrilled if I was chosen. I have not done crewel,I have done stumpwork with ribbon embriodery, I love the looks of the Talliaferro Designs and would love to do some of the projects. I am definitely a wool and hoop person. I am afraid I would get tired of the other before I ever finished a project. I think I am more of a wool & hoop person – it looks very straightforward. However, I would also love to be a Talliaferro designs person too – I have been following “Unbroken Threads” work on the Royal Persian Blossom design and have fallen in love with it. I would certainly enjoy the opportunity to work both designs and see which suits me best! designs. This is truly my style of stitching. I love detail and challenges. I began crewel embroidery with simple Jacobean designs many years ago. They weren’t much of a challenge, but I didn’t have the knowledge that I have today (from your blog}. I would love to toil the hours away on the Talliaferro. Um. I tend to lean towards nerdtastic stitchery, and I’m not sure either company embodies that (though both are gorgeous and amazing!). i dont know which kind. i have not tried it. probably the Talliaferro is what i like to try. Though I have not tried crewel embroidery I lean towards the Talliaferro in style and the colourings of this design. I think I’m really a Talliaferro kind of crewel stitcher, but I must admit the Wool & Hook pattern looks intriguing. Sometimes it’s nice to pick up a simple design and just have fun with it. I will have to investigate both of these design companies, though, as I am not familiar with them. I lean more toward the elegance of the Talliaferro design. I probably would not want to needlepoint someone a birthday card which they might just throw away! I’m a Talliaferro kind of stitcher.The designs are elegant,colors are lovely.Thank you Mary. Love the Talliaferro project. Another awesome one. I think am a Wool & Hoop girl – they look a little simpler and more my skill level. But I would love to challenge myself and learn news skills and try a Talliaferro design – just lovely. Thanks again for your give away! I’m more of a Wool and Hoop kind of stitcher but I think the flower would also be fun to make! Your ‘whimsical’ description of Wool and Hoop was very apt. I love how unfettered such artists and designers can be – think illustrators of children’s books – and I know I’m not like that. I am definitely a Talliaferro Designs kind of stitcher. I have the Persian Talliaferro design started but you can never have to many things on the go. I haven’t done Crewel for ever but would like to try it again and the pattern is very attractive and simple to get started with it again. The candles and wool project would be a quick and fun project also. They both look like some fun alternitives to my counted cross stitch. Hi Mary, I think I lean toward the traditional beauty of the Talliaferro designs rather than the Wool and Hoop designs. Having said that, some of the geometric designs on the Wool and Hoop page were delightful , especially the stars. I just love the Talliaferro design. The elegance and the colors are just devine. Crewel embroidery is my very favourite embroidery. I love working with wool. A few years ago I did a Jacobean footstool which I still adore. I am not a Wool and hoop girl. I have done some of their embroidery but it just a fun type of quick embroidery for me. My daughter does it for the children. I would love to win this competition as my daughter gave me as part of my Christmas gift this year a yard of crewel linen Twill and I have been wondering what elegant design I could use it for and the Talliaferro design would be perfect. I would then give the wool & hoop kit to her to use as she enjoys doing this fun type of crewel work. Definitly a wanna be Talliaferro stitcher. I can enjoy working on either. Fun & quick breaks things up from the more advanced pieces. Variety is key to my enjoyment of needlework. i love all sorts of stitching. I am more of a Talliaferro stitcher. Their items look more like the traditional Crewel work of Old English items. After you said the Wool & Hoop design was of candles, it still took me a minute to see what they were. Maybe it was their color than I just couldn’t translate into a candle. I do like some of their other designs. A bit of both, I think. I like the second design a lot more than the first — it’s a great update of very classic designs. But I do like other designs like the more contemporary design, ones from The New Crewel by Katherine Shaughnessy for example. Crewel emboridery is one of my favourites! And I would go for the more tradional Talliaferro style especially as I also love blue and think the subtle colours of the blue and taupe are beautiful. I have lusted after the book the New Crewel since I began embroidering in July this year and the Wool and Hoop design is one the front. It looks like group of baobab trees, very funky. I am definitely a Wool and Hoop kinda embroiderer, the designs are random, eclectic and imaginative. Talliferro designs are neat, clean, sophisticated, a bit formal for me. Definitely a Talliaferro Designs type. I love the colors and styles of their projects. I am definitely a Talliaferro girl – I have all the bits and pieces to join your SAL for the Royal Persian Bloom, acquiring my very own slate frame a couple of weeks ago so no more excuses! So please, please, please pick me for this giveaway. Then I will be ready for a Paradisio SAL if you kick one off! Haven’t done crewel in a while and winning this would be a good way to get me back in the groove. Definately a wool and hoop kind of stitcher. I actually have the book on my wishlist for the design in that first kit! It is so funky and awesome! I love both projects although I think the Wool and Hoop kit would suit me better. When things get a bit complicated, or when I feel that I’ve bitten more than I can chew, I get despondent and lose my enthusiasm – so shorter is better. I consider myself an all-type of stitcher but the Talliaferro designs are special: I´m busy with the Royal Persian Blossom design at the moment and loving it. My first introduction to stitching was huck towels when I was a child. I have had a needle in my hand off and on ever sense. The wool and hoop kit would work for me well now, but I am excited to learn new things. This “old dog” is learning new tricks every day. Funny ,when you are younger you’re scared to try for fear of failure. I’ve finally learned, just take it out and start over. Thank you Mary for all you do. I’m definitely a Talliafero design stitcher. I always prefer traditional designs over more modern looking and enjoy embroidery that has an historical look to it. I’ve been admiring the Royal Persian Blossom for some time. I am very much a Wool & Hoop stitcher!! Thanks for the chance, both kits look fantastic! I enjoy both styles very much but have to say I lean more towards the Talliaferro Design style. I just love the elegance of them. But then I like a wool and hoop style for something fun and different. It has been many years since I worked a crewel pillow cover. Both kits are marvelous, but I have to confess that I am especially drawn to the Talliaferro project. As to which design characterizes me (if I were to get really psychoanalytical) I would have to say the Wool & Hoop kit is probably how others see me, and the Paradiso 1 how I see myself. Thanks to you and Wooly Thread for the wonderful give-away. Oh, I am so a Talliaferro girl. Their designs are simply elegant. Old school, traditional, perhaps with updated colors or materials, but with a definate eye to history, that would be me. I am definitely a Talliaferro person. I like the formal lines and colours of crewel embroidery and have been toying with the idea of ordering one of their designs. The fantastic blooms and colours have always drawn me this form of embroidery. I would so enjoy doing this! I love crewel embroidery and am definitely a Talliaferro kind of stitcher. I have never done crewel work. Would love to learn! Hi Mary, My Christmas present to myself this year was to finish the Royal Persian Blossom. I love the Talliaferro designs, which are definately my preference. I found the Royal Persian Blossom to be enjoybable ever step of the way. I also feel it is important to do thing out of your comfort zone as it teaches you something new. So I think I would enjoy the Wool and Thread design as well. Thank you for all your inspiration through out the year. Wishing you a Happy and Healthy New Year. I am definitely a Talliaterro stitcher. I started in the ’60s with Erica Wilson’s classic crewel designs and while I’ve done more contemporary pieces, I love Jacobean crewel. Thanks for sharing all your wonderful experience and enthusiasm with us. Hi Mary! I hope you had a wonderful Christmas!! Of the two types that you’ve shown us today, I could do either one. The Wool & Hoop design is whimsical and fun, while the Talliaferro design is so elegant. When I first started hand stitching (years ago), I did mostly crewel work and then meandered off to cross stitch, but the more I see and read your website, the more I want to get back to my roots, so to speak. Thank you for all the opportunities for me to do that. I hope you have a wonderful and happy New Year!! Definitely a Talliaferro Designs person. I love complex designs with a play of colours, especially when it’s long and short stitch. I’m definitely a Talliaferro type of stitcher! I’m not very conventional in the rest of my life, but I do prefer more traditional crewel embroidery. I am love to do both but I really love to do the Talliaferro design. I love the eleganT and challenging design. When I was younger, much younger, I would love to do challenging crewel work and give it as Christmas presents. I still see those gifts at my fathers house. I have just found your website and am very anxious to follow. Thank you!!! HAPPY NEW YEAR!!! I am a Talliaferro Designs kind of stitcher, so far. I’ll admit I’ve not tried crewelwork yet, but the jacobean designs I have done are more like the Talliaferro one. I would love to try either kit out, though, and thank you for the chance to do it! I’m more of a Talliaferro Designs kind of stitcher. I’m not really interested in the more modern designs. I’m an old school kind of gal. To answer your question, I go more for traditionally-inspired looks than contemporary ones. I am not inspired by the Wool & Hoop look, but Talliaferro appeals to me and would slip right into my arts-and-crafts renaissance decor. But if I were stitching a gift for someone with a retro-modernist apartment, the playful, graphically simple Wool & Hoop pieces would be perfect in a hip futurist-50s or 60s era room. It’s been years since I’ve done any crewel embroidery, but traditional designs are still more appealing to me. So I’m a Talliaferro person. I recently found some of my old work in the back of a closet and have been thinking I need to get back into it. I am immediately drawn to the Talliaferro design, which is much like crewel pieces I have done. On the other hand, wouldn’t it be fun to stitch up somee funky candles, just because you can? I just love the Talliaferro Designs and crewel stitching is my all time favorite. I love the elegant look of the designs.I would love to win this kit as it is a bit pricey for me right now! Oh Mary! The give-aways keep getting better and better! I looked the Wooly birthday candle kit first and loved it. Then, the elegance of the Paradiso 1 just struck me down. The suavity of the design, the subtle play of the colors! To answer you question: I would like to think I am a combination if both but I have to own that when it comes to my actual stitching, it usually comes out Wool and Hoop. I love both but in my heart I guess I tend more towards the whimsical and funky. I admire the elegant Talliaferro but I love the Wool and Hoop. You make the both sound so much fun–and quick and easy–I dying for both of them!!! Thank you Mary! So sorry! I forgot to put in my name: Barbara B Ellettsville, IN. please disregard the one without my name in it…. Have completed embroidery projects in Wool/Hoop but would like to attempt Talliaferro Designs. Would love to try my hand at Talliaferro. I Just love the look of crewel work. I was lucky enough to find Crewel Embroidery, by Erica Wilson. It was buried in a box of dusty dirty fabric at a flea market for 25 cents. I had no idea what a little gem I had till I got home with it. I am defiantly Talliaferro Design girl. Jumped right in with the SOL. Found the wool is not easy to work with. Need more practice. I like both but I probably lean more towards the Talliaferro Designs more. I like cards and quick projects but my favorite thing is fine stitching and so I like the Talliaferro the most! I am learning how to do crewel work now with my EGA group and I would love these kits to help me practice more. I’ve got to say that I am more of a Talliaferro Designs kind of stitcher. The flowing design and the colors do the trick for me. I’m a traditional kind of gal, and I am drawn to the stylized flower designs. Crewel is one thing I’d like to do more of. Hmmm…good question….I think I am a little of both. It depends on what I am doing and my mood! I like to design my own things, but use others as an inspiration so I like both! Well, this is almost eerie! I have long desired to buy the book, “contemporary crewel embroidery” which has those weird trees–that look like they are from the moon! And then to see if on “Needle ‘n Thread”– well, just too much of a coincidence! the Talliaferro is a coincidence as well. I remember looking at the pictures of a pomegranate done by Talliaferro and considering to buy it–now to see it again–well,it ‘s almost like fate! I am proud to say that I am both kinds of stitchers–I enjoy contemporary crewel as well as traditional patterns. I don’t think people should distinguish themselves based on either pattern–I enjoy doing both types, depending on my mood. I haven’t done much in the way of wool embroidery. But the Talliafero design looks so beautiful. I did some crewel embroidery a long time ago. But this project would certainly get me back into it again. I am at present learning the art of “Crewel Embroidery” and I am getting on with it really well. It would be great to win this set, so I have something really great to move onto. Thanks. I’m definitely a Talliafero style of crewel embroiderer. The more elegant the better. That being said, I would enjoy playing around with the other style, to broaden my horizons. I love the variety of embroidery available and love to dabble in a range of styles, but the crewel work, Talliaferro designs are just stunning.Much prefer this to the more modern wool and hoop kit. I think I am a more of a Wool and Hoop kind of gal. I like small funky things to work on once in a while that don’t take a lot of time. It would give me a change of pace from the embroidery projects I do that seem to take forever. I like the Talliaferro design better – I love elegant, historical looks. But as far as giving away a birthday card, Wool and Hoop has a much wider appeal! hard for me to breat out of my comfort zone. Definitely a Talliaferro style stitcher. BUT I love to do small projects along with the big projects so that something gets done quickly. Wool & Hoop designs are especially nice for embellishing. All crewel is wonderful!!! Hi Mary, Another fun treat today, well I have to say without sounding like a snob that I am a Talliaferro Designs kinda gal. I so precious little time for my needlework lately that I am inclined to take on a project that will give satisfaction of learning some new stitch or trying a design I would not have tried before. Besides, I LOVE those colors. Very beautiful! Thanks Mary for the opportunity for these fabulous giveaways. I’ve been a “serious” stitcher without the money for more “frivolous” stitching. I would love to do a Wool & Hoop kind of design if I could justify the expense; I would love to do something more lighthearted. I really like some of the designs. My special interest is in Jacobean style crewel work so that is what would characterise me and put me in the Taliaferro camp. Economics mean that I have focused my interests; I’m trying to do one style well but I would love to expand my experience. So I’m a Talliaferro stitcher who would like to work with both styles. I haven’t seen crewel work kits in a long while. maybe I don’t shop in the right places. I would love to start up crewel work again. It is quicker than needle point or redwork. I wish I could win that kit!!! I love your daily emails to my mailbox. always fun to open and read from a friend. thanks!! I would love to the a Talliaferro Designs kind of stitcher but I’m more of a Wooly & Hoop kind at the moment. I’m just learning embroidery techniques after doing cross stitch for years. I love the idea that you can start with the Wool & Hoop and then move to the Talliaferro Designs kit once you are more comfortable. I bought the Persiam Blossom design earlier in the year but am yet to tacle the stitches! Both designs are great so I’m happy either way!! Great giveaway! I think I’m more traditional, but my daughter is a Wool & Hoop girl! I think I am more a Talliaferro stitcher. The very first needlework I did MANY years ago (when I was in college) was crewel. While I’ve cross stitched, needlepointed, crocheted, knit, and sewn over the years, I’d love to do some crewel work again. Hmmm… I have not done either. What an inspiration to try and learn. If I had to choose one though I would definitely choose the Talliaferro. Beautiful. I am an everything stitcher. No stitch is too daunting or too easy. I usually enjoy projects that i like the pattern of. Ex. If i love the pattern, i will learn the stitches to make it beautiful. If the stitches are easy, then all the better… I can move on to something new quickly. I’m more of a whimsical stitcher and like to have room to improvise when I’m making things. I do however like a more detailed, intricate project occasionally. Both are lovely! I am definately more of a Taliaferro type stitcher, but I’m teaching my granddaughters to embroider and the Wool and Hoop design would be great for one of them. When it comes down to it….isn’t ALL stitching wonderful in it’s own way? I like tallia ferro stiching more. I used to do the wall decorating embroidery. The originality is more in tallia ferro stiching. The Talliaferro design is lovely. I think I am more traditional in my stitching and crewel work as I age, lol. I like the fun and wacky designs but I tend to give those types of stitchings to friends as gifts and keep the traditional items for myself. I would be happy with either of these prizes and appreciate the opportunity to win. Definitely a Talliaferro Designs stitcher. Somehow I missed the funky gene. I’d have to say that I am more of Talliaferro Designs girl for works I do for myself, but I definitely work on more whimsical designs such as Wool and Hoop’s when I stitch for my daughter. I guess I am both kinds of stitcher…I love the fun designs that can be done in wool but I also love the beautiful designs of traditional crewel work. I am somewhere in between. I like the clean lines of the Talliaferro Designs, but I like the whimsicalness of the the birthday candles. I have a lot of Christmas pieces that give me the ability for fun yet detail. Would love a chance to this and have it ready for the next family birthday. Just love wool!! I am definately a Talliaferro type of stitcher. As it is a design with instructions I would love to make it in purple and taupe as that is my bedroom colours. Didn’t realise Appleton did Taupe colours. I think the wool and hoop design would make a great quick fun project to practice satin stitch without being too precious about it and then it would make a great birthday card for a friend. Most of my work has been in a traditional rather than modern style. I love the visual intricacy of the detail. When I visit a museum or art gallery, I usually beeline for the textile section. Sitting and savoring the flow of line, absorbing the calming or riotous energy of the colors, I find myself fantasizing about the now-anonymous embroidery workers, men and women, and the sumptuous and privileged life of the one who commissioned the garment or ornament. Or I time-travel to the candle-lit wood-floored rooms to imagine the girls and women bent over their work, in fingerless gloves to keep hands supple and moving freely in the winter-cold rooms, dedicated to working a sampler to be displayed with pride. Studying their work is like listening to a symphony with your eyes! I would have to say that I am partial to the Talliaferro. The blues and tans are so pretty. Oh yes, wool and hoop.I was taught at a young age how to stitch. I love all the jacobean designs and the motifs they use to stitch on their robes,bed draperies. ect. sometimes I snag a book at a thrift shop full of these old designs. Love it!! Had I answered these questions a year ago, I would’ve answered Talliaferro Designs all the way, but I’ve discovered a playful, modern part of myself over the last year that is open to modern interpretations of crewel. So I am definitely a mix of the two. What wonderful gifts these would be! And the Talliaferro design is lovely, lovely. Wouldn’t it be a wonderful beginning project for the New Year? Thanks for the opportunity to win it! Gostaria de ganhar,para borda-lo. Obrigado. Feliz Ano Novo. If I was a good stitcher, I would definitely side with Talliaferro Disigns!! I am a Talliaferro type of stitcher. I prefer the more traditional style. Mainly I’m a “wool & hoop” stitcher but love the Taliaferro. Each style has its own pluses and lots to learn about. Gosh, I think I’m a combination of Wool & Hoop and Talliaferro Design . I’m totally a Wooly Thread girl! I just got the book with the same photo on the cover for Christmas. I love goofy looking embroidery. Traditional embroidery isn’t my thing but I definitely want to learn it too. I really like the Talliafero design. Not only would it be gorgeous in crewel, but it looks like it might be adaptable for blackwork as well. WOuld like to do the Talliaferro, A white Lily on black background would be my first design. Although my tastes tend to be more towards the modern, Wool & Hoop type, I love trying small traditional crewel projects every once in a while. The Anchor Book of Crewelwork has tons of small, compact designs that work really well traditionally, but that you can inject a bit of crazy modern twists into. Oh, my, I am a bit of both, really. It all boils down to the mood I am in at that time. the talliafero is lovely i just stitch what i think is pretty, so it doesn’t really matter what brand or kind. I like both of these designs, but i am more of a traditional kinda gal. They both look like they would be fun to stitch up though. Hi.. New reader… I have never done any crewel work, but I have wanted to for some time… Stylistically, I am more of a Talliaferro gal. Definitely. I think I may be a Wool & Hoop kind of stitcher enjoying the fun of it but I think my favorite is still the beauty and the more advanced work of the Talliaferro Designs. So I guess you could say I am a little of both. I am definitely a Talliaferro design person. I love Jacobean crewel. I am not into quirky but I AM into wool threads and I absolutely LOVE the Jacobean designs designed by Talliaferro. So I guess I am a bit of both. I think I’m both. Sometimes I’m in the mood for whimsy, especially when I’m stitching for my children. While other times, I prefer a more classic design. I’m definitely a combination stitcher. I like to fix and/or repurpose worn items around the house. The item is usually not going to look brand new when I have patched it or changed it. Why not embellish with a little fun like Wool & Hoop style?! If I’m beginning something new and a little more sophisticated project, I like the Talliaferro kind of designs although I may sometimes liven them up using color. I like talliaferro designs. But I haven’t done any crewel embroidery. Planning to start with small designs and then buy a talliaferro design. Talliaferro is more my style…really like the Jacobean stitchery.Getting one of those kits would be phenomenal as Talliaferro kits are way out of my price range. I am a Talliaferro stitcher. I love that design and it must look great finished and framed. I think I am a Talliaferro Designs kind of stitcher but am always open to try new things. Thank you for this opportunity. I like the 2 kits but the one I prefer is the Talliaferro design. I discover recentely Jacobean crewel embroidery, I love it and this design has wonderful colours. I’ve only done two crewel pieces over my many years of stitching. Both were the large printed pieces of the 1970s. One I had framed and gave to my grandparents as a Christmas gift. They hung it in their living room and it was there until they both passed away and it came back to me. It now hangs in my dining room and I think of them every time I see it. I am definately more of a Talliaferro Designs kind of stitcher! I am eclectic by nature. Many styles appeal to me but deep down I am a fancy pants so the Talliaferro caught my eye. Hmmm, this would look good with the Renaissance Wool being given away, wouldn’t it (wink wink)? Wool and Hoop. Hands down. Wool and Hoop. A bit behind in my comments. To answer today’s question, I am very much a Talliaferro Designs stitcher. I like the intricacy and finished look of such designs. I am a Wool & Hoop kind of stitcher for sure. I have not always been that way, but as I get older the Wool & Hoop kind of stitchery seems to make me happier. Go figure. I will admit to being none of those things but willing to try! I am a dyed in the wool traditionalist, so perhaps it is no surprise that I describe my style as Taliaferro. Though, I absolutely see the appeal of smaller projects that are not so involved. Sometimes I squeeze in a fun, quick project (or two) if I am working on a rather intricate project for a long time. I remember one whitework sampler that was so intricate and time-consuming, that it took me 2 years to finish. Needless to say, I did lots of fun little projects for quite a while after that! I am more Talliaferro Designs, the Paraddiso design is beautiful, I like the color. Oh my, this looks wonderful! Though I am fairly new to it, I am a crewel enthusiast and I am definitely more along the lines of Talliaferro. Thank you for the opportunity to win these! I shouldn’t really put my name in on this one since crewel embroidery isn’t something I’ve ever tried (or necessarily something I feel quite ready to try just yet! I actually only found your site because I was looking for online embroidery resources as I’m just beginning to learn – all those videos? bam! I’m sold! ), but looking at all those Talliaferro designs on The Wooly Thread really, really makes me want to get there. I love both styles, but I have a real fondness for the beauty of all those Talliaferro designs. It blows my mind a little to think about being capable of making something even half as beautiful as that. I think I aspire to be Talliaferro Designs, but it doesn’t quite get there. Crewel is new to me, I have looked at kits and tried to figure out which to buy for my first try. You know how it is, you want something that you will enjoy doing so you will finish the project. The Talliaferro Designs is my style of work. I live in a small cottage type home and love to decorate with items that suit the house. Nothing too modern. The house suits me as I am a county gal. I am a Wool & Hoop stitcher, though the Talliaferro Designs would be a good learning experience in shading and stitches. The candle design would be interesting in a birthday crazy quilt. I keep trying to add whimsey to my life which implies Wool and Hoop but really I am more of a Talliaferro Designs type of stitcher. I’ve very much a Talliaferro girl. While Wool & Hoop is really cute I prefer a more dramatic style. Magnifique ces 2 kits. Mon préféré est celui Tailliaferro. C’est un kit que j’aimerais bien posséder. Cette technique est de toute beauté. I’m more of a Wool & Hoop stitcher, but I love the elegance of Talliaferro! I am definitely a Tallifero fan, much more traditional although I do on occasion like whimsical modern pieces too. Oh – a Talliaferro stitcher. Although for my grandchildren, I like the whimsy of the Wool & Hoop kinds of designs. I think I am the Talliaferro stitcher. I have done some crewel embroidery and some silk surface embroidery but have found I enjoy stitchin with wool.I have come to like the look of this kind of design and I do like shades of blue.Thanks Mary for giving us the opportunity to win the these kits. Talliaferro definitely – I love the very intricate and complicated type of work. I stitch for the joy of stitching and if I get a project that will take many many hours – all the longer to enjoy doing it. Never done any crewel but would love to learn and My kids may end up learning even before i get my hands on it!Thank you for doing this! What a choice. I love the tradtional Jacobean of Talliaferro then there is the Fun Crewel Wool -look like firecrackers ready to go bang. I have the book and bought some beautiful white Ecclesiastical for the other designs. I am (still) doing Susan O’Connor’s Elizabethan blanket. Then wool just makes the most beautiful fruit, nuts, vegies,animals, flowers. Wool has this flexibility. I love both the quirky & the tradtional. right now, I’m mostly wool and hoop. I’d love this prize, I have the book The New Crewel and I love it. Thanks for the chance! I’m definitely a Wool & Hoop kind of stitcher, but with a little bit of Talliaferro Designs too. I’m definitely a Taliaferro-type of stitcher… it’s more like historical embroidery, and I’ve loved to do that since a child (one of my first projects was a Jacobean pillow on linen ground with wool!). I’m definitely more attracted to the Jacobean design and type of work but it would be fun to try the Wool and Hoop kit for something new! I would have to be a cotton and hoop stitcher. Never used wool, and never tried Taliaferro style. (which is a bit embarrassing since I lived in England for a while and never picked up a kit). I am game to try either one. It would be fun. I’m a beginner, so I haven’t done enough to know that yet! I really could not tell you which one. I am still a novice with embroidery. But I am willing to try anything new. I definitely prefer the Tallieferro type of stitcher, the designs are wonderful and so elegant. I have done both types of stitching but prefer the Talliaferro Designs. Talliaferro is more in line with my tastes however I have never worked with wool and I believe the Wooly Thread project would be perfect to sink my teeth into. I’m a wool and hoop kinda girl but I have done both. I think I’m more Wool & Hoop-I am definitely drawn to modern designs and bright colors. But I do love traditional florals too, so maybe it’s really a tie. Thank you for providing the links to various suppliers. I went to Wooly Thread’s website (which was new to me) and within a few minutes had placed an order. This whole give-away process of yours has been a wonderful lesson in stitching resources. Thank you also to the suppliers for furnishing products for the give-away. I would consider myself a wool & hoop kind of stitcher. I’m definitely more a Talliaferro Designs kind of stitcher though I’ll try any form of wool embroidery. I just love working with wool. Oh, those are my colors! I believe that is one of the prettiest Jacobean pieces I have ever seen. But wait, there is something about the first kit that I love. It’s whimsical and looks like just plain fun. So I’d have to say that I’m a combination of both types of stitching, but my heart sings for that Talliaferro design. Taliferro has a more elegant look which appeals to me. Oh I definitely love the Talliaferro! Beautiful! Both of today’s prizes are wonderful but I am drawn more to the Talliaferro designs. They seem to precise and detailed. A bit scarey! I have done a few crewel projects with wool and find the variety of stitches used make crewel work interesting and challenging. MY older-year goal is to master the skills I started long sgo but gave up on. I took a crewel lcass in college, dabbled a bit then had 7 children. Now I am returning achieve may master goal. The Taliferro kit wil help me alonmg ythaty goal!! I am probably a birthday stitcher right now, since it has been many years since I completed any crewel projects. It would be a great “refresher” project, I think. I am very attracted to the Paradiso I design, though. It would be perfect to stitch after the birthday wishes stitchery. I am just starting crewel embroidery so the Wooly Thread kit w2ould be a great way to learn. The Talliaferro Designs kit would be the type of embroidery I would eventually like to be able to do. Both kits are great because they have such different feels. I would love to do some crewel embroidery as I have never done anything in wool, but would also love to do some Talliaferro designs they are just so intricate and lovely to look at. I do love working with natural fibers. As fo design oreference, I find myself favouring the Talliaferro designs the most. I love the embroidery from the 16 & 17th centuries. I am definately a Talliaferro Design type girl. I tend toward stately and elegant designs over funky and stylized projects. I am definitely a “Talliaferro Designs kind of stitcher” – I’m old-fashioned, I guess! The Wool & Hoop project is a little too “funky” for me, but my daughter-in-law would probably love it! I’d give that project to her if I won it – she is an avid crafter like me. Definitely Talliaferro! Although there is a place for the Wool & Hoop style in my stitching world as well. But for the pure enjoyment of the experience and accomplishment, it’s definitely Talliaferro. I am a combination of both. But I must admit the Talliaferro catches my eye. I appreciate the look of both types of stitching although I am more drawn to the Talliaferro designs I have seen. I always seem to imagine them on a beautiful hand-carved footstool, go figure. I appreciate both styles, depending on the type of project that I’m completing. I would love to complete the elegant Talliaferro design which appeals to me more. However, the Wool and Hoop project would be fun! I have a friend who would enjoy receiving the “birthday card” stitched by me. Talliaferro. Yet, I have enjoyed wool and hoop in the past. I think I am a toss up between being Wool & Hoop kind of stitcher, and a Talliaferro Designs kind of stitcher. I like both but I tend to enjoy my stitching more when I don’t have to be so precise which I think the Talliaferro diesgns needs. Maybe it depends on the mood! Both look like fun in different ways. I am partial to the blues and tans in the Talliaferro design. Funky is fun too though, guess it depends on what and who it is for and my mood. More of a Talliaferro stitcher. I love stitching with wool and usually prefer more “traditional” or vintage designs. The Wool and Hoop would be helpful since it is complete if I desire starting immediately but the Talliaferro design pictured is so beautiful. I guess if I were choosing between them it would be the former. I love all crewel work but Talliaferro for preference – I love the designs. Thanks Mary, and I hope you have a very happy new year! (Sorry, my web site is aunder construction and if you try to go on it you’ll be directed on the blog). Oh Definitely Talliaferro designs; j’am waiting for the other designs to stitch. J hope they will come out soon. I’m a definite Talliaferro girl at heart but feel that I should try something a little more adventurous sometimes. Perhaps I need modernising? I did noy miss the 4th day – I loved the embroidery – I wished – and then did not enter, but am glad it is not too late. I am a Talliaferro Design stitcher, I would dearly love to have them to do, would be wonderful to be so lucky, they are gorgeous. Thankyou for all your work to arrange this, and of course, to all the folks who are being generous in supplying all of your 12 days gifts. I love some of the playful designs from Wool & Hoop and also think the Talliaferro designs are gorgeous. I am somewhere in the middle as I look at my own stitching… not as detailed as the Talliaferro but sure a tendency to a gorgeous complex design. Playful fun is always appreciated! I have not done crewel embroidery for a very long time. This would be a great way to restart. I would have to classify myself as a Talliaferro Designs stitcher, when doing something meaningful. I enjoy the primative look in just plain ol’ embroidery, tho’. The only crewel I have done is the Nesting place class (still yet to complete this needle book). So would be happy to complete both designs! but I must say I prefer the Talliaferro Designs stitcher Kit – so elegant. I think I am a little of both. Although of the two kits I think I definitely like the Talliaferro designs one better. I think it depends on what kind of mood I am in. I haven’t ever done crewel, but would love to try! I’m definitely more of a wool & hoop girl. I’m learning crewelwork, so this giveaway would give me one kit in my current range, plus one to grow on! What fun this project looks to be, would love the chance to give it a try. Recieving a greeting card made in this fashion would be over the top. Will keep my fingers cross for this one. I haven’t done any crewelwork in ages! Both kits are fabulous…and are appealing to me for so many reasons. Oh, I am definately a Talliaferro Designs kind of stitcher. Years ago I worked several crewel kits, but then cross stitch took over the market so I could no longer find any crewel. I didn’t know enough to realize I didn’t need a kit!!! 🙂 I have learned so much from your daily eMails, and now that life is somewhat slower, I find myself rekindling my love of all needlework. Thank you! My first response would be a Talliaferro stitcher, but I see value in both. Sometimes you need a bit of whimsy in life and sometimes you just need something quick! I haven’t done crewel work in a long time but do lots of embroidery because I love crazy quilting. I’d like the Tallefarro kits. These give aways are a great way to try treads and designs that my budget will not let me do. I have done some small kits with wool. Just a taste. Both! Well, to clarify, I like both. I can’t say I could DO both without taking a deep breath. I like the playfulness of the Wool and Hoop kit and the elegance of the Talliaferro design. Thanks for the offering. Talliaferro Designs kind of stitcher I am. I love the elegance of the design and the classic feel to it. It looks like it would be something that was done a couple of hundred years ago. I am a Wool & Hoop kind of stitcher, longing to be a Talliofero. I am definitely more of a Talliaferro type stitcher. I haven’t done any crewel work recently and both designs look fun. Thanks again. Hmm… What I like about freehand embroidery is the freedom it gives me, unlike cross-stitch, and that the patterns available are so much more modern and fresh than the ones that are often available for counted cross-stitch. So maybe I’m a Wool and Hoop kind of stitcher! But that Talliafero design is so beautiful, I might well be converted! Wool and Hoop kits make great beach holiday projects, for the freckled sand-speckled me. Talliaferro kits are for the elegant great lady me, heroine of my own adventures! I love crewel embroidery! What a great birthday gift. hi. i’ll say i am both. i enjoy funky contemporary cute work as well as classic ornate ones from time to time.i basically love using needle,designs dont intimidate me.. I am a bit of both and can work with or without a hoop. Also both types of designs are nice. I am a Talliaferro Designs kind of stitcher because of the artistic style of it. Now that I know how to work with wool with out having allergies affecting anything, I can actually do the stitching! Jacobean, Victorian and now Talliaferro’s designs… I am still hooked! Dear Mary, I discovered your website in the spring of 2011, and I have read your posts every day with pleasure. I defenitely am a Talliaferro kind of person. The Wool & Hoop kit would be very useful however: it help me in practising the satin stich! Two kits! Wouldn’t this be a fun birthday present? And guess what, the 9th is my birthday:) I love fabulous threads and Jacobean designs…this would be alot of fun. These too are truly wonderful products, but between the two I’d have to say I’m more of the Talliaferro kind of person. BUT THEN ON THE OTHER HAND … I do LOVE the quirkiness the Wool and Hoop design. So you know, it just might boil down to the time of day one would ask me which I prefer. I think I lean mostly toward the Talliafero Design, but I do have my quirky moments. It just depends on the occasion. I’ve liked embroidery for a long time, but I hadn’t done much since I was a kid, until this Christmas when I decided to make our moms a set of tea towels. The designs were more sophisticated than I 1st thought, but I had a great time learning, and they turned out just great, thanks in part to your wonderful site,showing me how to do all those wonderful stitches! I’m *MUCH* more Talliaferro-style–though honestly I suspect I world work both pieces for the experience and give both FO’s away–the Wool & Hoop really isn’t my style, and the Talliaferro would be lovely for my Mom. These are both so beautiful, I would love the opportunity to work with either. Thanks. Definitely a Talliaferro design person. The Wool & Hoop doesn’t present as much challenge and I don’t care for the designs as much. I have to say I am more of a wool and hoop style. But, I`ve been known to meander into the Talliaferro style when a special gift calls for the style. Both projects are great. Definitely traditional when it comes to needlework. Love the design of the Talliferro, and the colors as well. I like Talliaferro style better. Although I am not much of a crewel stitcher, I really like this pomegranate design. I think I’m more the Talliaferro Designs type. This is so beautiful and blue! My favorite! I really like structure. However, having never done crewel embroidery, I would love the wool and hoop kit for the learning experience. I think that I could be called a fan of either style of stitching, depending on my state of mind at the time. These projects are wonderful. I would say I’m more of a Talliaferro person, but occasionally I do a more quirky project, calling them my guilty pleasures. It keeps me from getting stuck in a creative rut. The Talliaferro design crewel work would be more my style. I really enjoy working with wool and love the crewel designs. I think Wool & Hoop – I prefer a more modern approach. However, having said that I have more a problem with the traditional colour palette than the actual design. I’m not an earth tone type of gal. I really like this set, particularly as the whimsical is the cover of that Shaugnessy book raffle I participated in last year (and sadly lost) so this would be a good consolation prize. And the TalliaFerro package….well that’s divine..and definitely over my head but divine. I really like working w/ wool. I like both designs actually and have the book that the birthday design comes from. I would definitely do both designs! I am a combination of both. Sometimes I like the difficulty and structure of projects like Paradiso I which increase my knowledge or bring me to a new level. But I also like to break it up with more whimsical endeavors that maybe purely entertainment or stress free. That said I probably still identify more with or would characterizes myself as the Paradiso I.
Melissa H. from Payson, UT. I am definitely a talliaferro kind of stitcher. I love intricate designs that are probably meant for much more experienced stitchers than I, but I have always been one to bite off more than I can chew, and power through – and usually end up being really proud of myself in the end! I would have to say that I am more of a Talliaferro style person. I bagan doing crewel work in the 70’s as an Erica Wilson fan and though I have moved to a quilting compulsion I still love classic crewel designs. Supplies and patterns are becoming more difficult to find. Of the two types of stitching you have pictured, it seems that I would be the “Talliaferro” kind of stitcher. One of my granddaughters would choose the Wool and Hoop. Previous Previous post: Third Day of Christmas: Japanese Silk – Lots of It! Next Next post: Fifth Day of Christmas – Evertite Stretcher Bars!